Before settlers came, the entire northern half of Wisconsin was one large, thick forest. It was said a squirrel could cross the state without ever having to touch the ground. 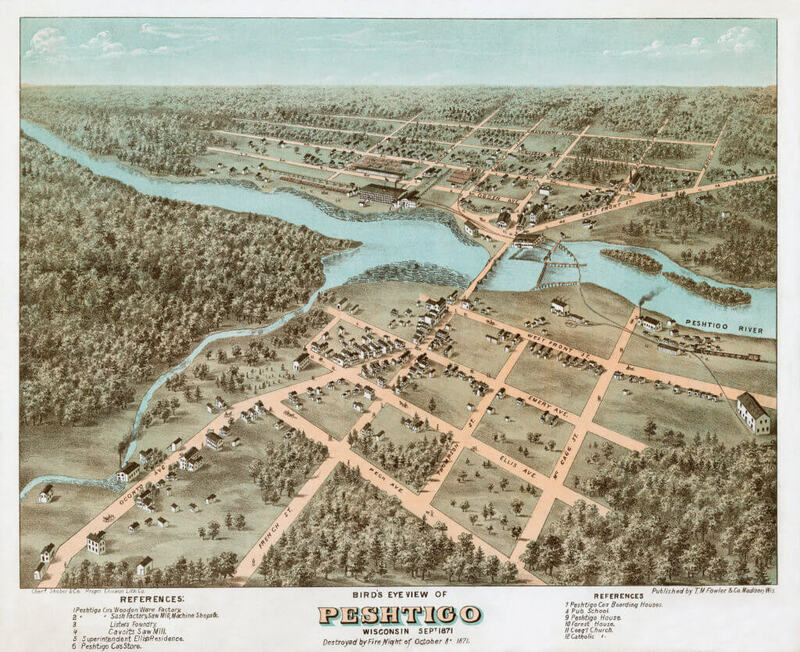 The community of Peshtigo was estimated to have about 2,000 permanent residents in 1870, though the population swelled due to immigrants who came to work in the lumbering, manufacturing, and railroad industries. Many German and Scandinavian immigrants also established settlements, some west of Peshtigo in an area of dense hardwood called the Sugar Bush. By 1871, Peshtigo had become the most fully developed settlement in the region. It boasted the largest woodenware factory in the world, cranking out household items made of wood. It was also the home of one of the largest sawmills in the nation. Much of this industry can be traced to William Ogden, former mayor of Chicago, who recognized the opportunities in the area. 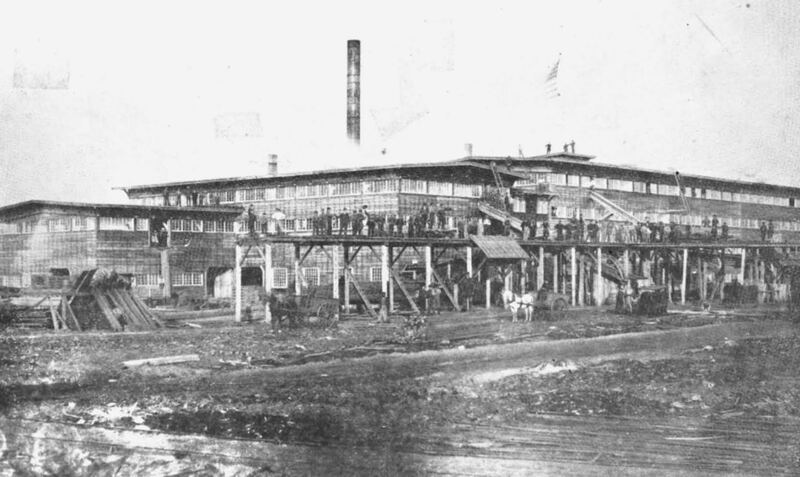 He bought thousands of acres of forest and built the sawmill, woodenware factory, boardinghouse, and dry goods store. 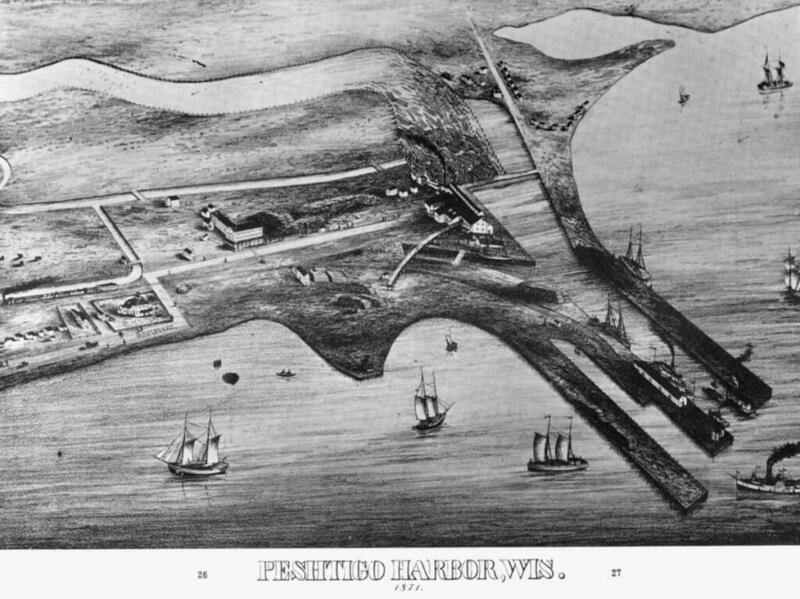 He established a barge line between Peshtigo Harbor and Chicago and brought railroad lines to the region to bring lumber to the sawmill. Trees dominated the landscape. The forests of northern Wisconsin were hundreds of years old. Pines grew 120 feet tall and three feet across. Lumber from three trees was enough to build a good-sized house. Because Peshtigo was surrounded by great forests, wood was plentiful. Most buildings in the community were made of wood, complete with wooden shingles. Wood was stacked next to the houses for winter. Sidewalks were made of boards, and trails between towns were updated to corduroy roads made of split logs. Bridges were made of planks supported by timbers. Household goods included wooden tubs, broom handles, clothespins, barrels, and pails. Sawdust from the woodenware factory covered the streets to keep down dust and mud, and was also used to stuff mattresses; the excess sawdust was piled. When the low river levels from the drought of 1871 prevented timber from being floated, the logs were piled near the riverbanks. Fires were common around Peshtigo due to industry practices. Lumberjacks would clear an area, set fire to branches and other remaining debris, and move on. Farmers would clear their own fields or move in after the land was cleared by loggers. Farmers removed stumps by burning them. Railroad construction crews also set fires to clear debris. Also, steam engines occasionally spewed sparks from their smokestacks. Night was setting in, and nature was silently preparing for the season of rest. The only sounds audible were the crackling of a tiny tongue of fire that ran along the ground, in and out, among the trunks of the trees, leaving them unscathed but devouring the dry leaves that came in its way…Fanned by the wind, the tiny flames previously mentioned had united and spread over a considerable surface. We thus found ourselves in the center of a circle of fire extending or narrowing, more or less, around us. We could not reach the men who had come to our assistance, nor could we go to them without incurring the risk of seriously scorching our feet or of being suffocated by the smoke. They were obliged to fray a passage for us by beating the fire with branches of trees at one particular point, thus momentarily staying its progress whilst we rapidly made our escape…I learned the following day, on my return to Peshtigo, that the town had been in great peril at the very time that I had lost myself in the woods. On September 24 (about two weeks before the Great Fire), the woods west of town were burning. Sparks ignited the pile of sawdust next to the woodenware factory. The factory sounded its alarm whistle, and men from the town put out the fire with buckets of water from the river. On the same day, a fire ignited in Marinette and was put out by the new volunteer fire department. Other small towns on both sides of the bay also fought fires the week before the great fire. Because of the constant fires, the air was often full of smoke. Some days school was closed because of it, and lamps were lit during the daytime because the sun was blocked. Ships in the bay blew foghorns and navigated by compass even during the day. Some people became ill from breathing all the smoke. Flakes of white ashes fell like snow, accompanied by occasional embers. People anxiously watched the glowing horizon every evening. 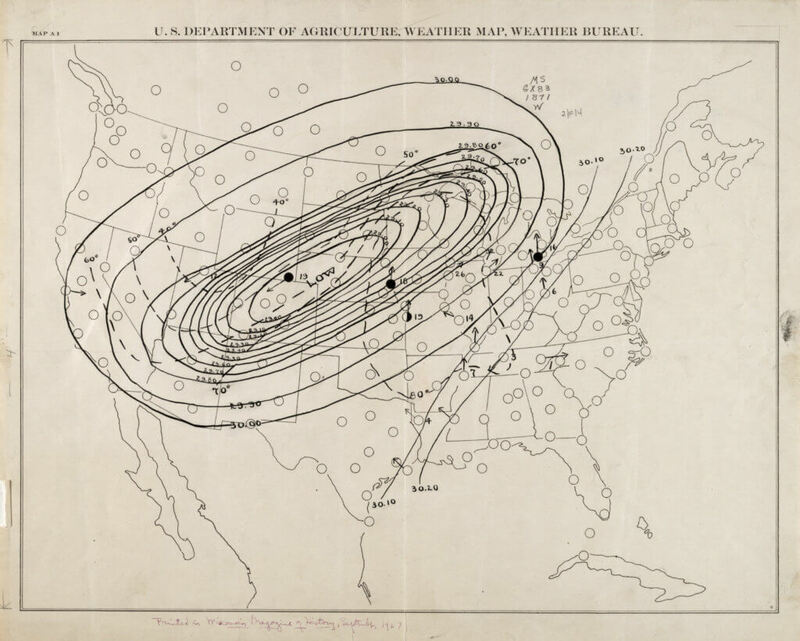 The fall and winter of 1870 were dry, followed by an even drier spring and summer of 1871. Marshes became so dry that local Native Americans would not use canoes to gather wild rice. Rivers were so shallow that logs were stacked alongside, waiting for rain. In October, a huge low-pressure cell formed in the west. In a low-pressure system, air rises and cools off while air around the cell rushes in to replace it. This causes a counterclockwise spinning. The largest low-pressure systems are hurricanes.